To Meredith & Suzanne for surprising me with a TLC-style "While You Were Out" home office makeover. This is part of the after pics. 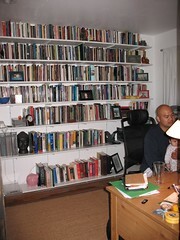 Those are most of my poetry books (some are in my office at school). The bottom shelf's reference.